I’ve used this in several projects — reading out the marker frequency in my sweep generator, setting up my DIY RF generator to verify the ebay counter was working properly, etc. 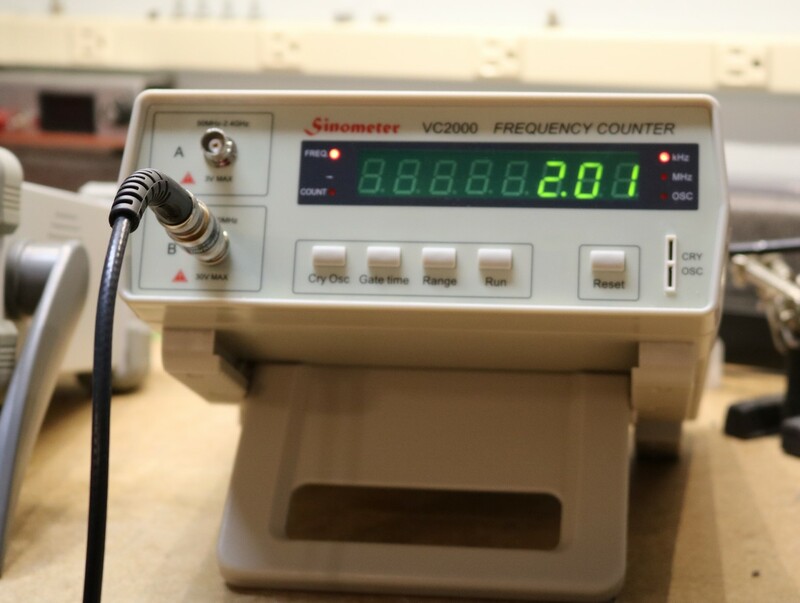 A standalone frequency counter is a handy tool to have, but it’s probably not essential. Many modern digital storage oscilloscopes will have built in counters, though I haven’t found the one in my Rigol DS1054Z to be quite as accurate. Even my Siglent arbitrary waveform generator has a built in frequency counter feature. There’s a few user interface annoyances with the Sinometer VC2000. It has several different ranges which are identified numerically. The first range corresponds to the “A” BNC jack. The second and third ranges correspond to the “B” BNC jack. Another range is used for measuring period, and another for operating in count mode. You sort of have to keep these ranges memorized, or have the manual handy. I was pleasantly surprised at the overall construction — the video at the top of this post will show a quick teardown. For < $100, it seems like a fairly decent instrument.